This review was written by Tara White, RN. 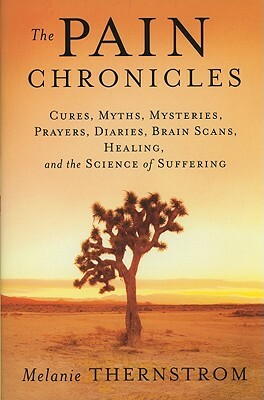 The Pain Chronicles, by Melanie Thernstrom, is simply the best, most readable, most thorough and enjoyable pain book I’ve ever read. Melanie Thernstrom captures your attention from the first page in her meticulously researched masterpiece. She grabs hold of you, just as pain does; only you don’t want this pain thriller to end. I wanted to shout, Yes! This is how I feel! I wanted my husband, my mother, and my daughter to read it to truly understand what living with chronic pain is all about. I wanted to hand it to all the well-meaning who ask, Are you feeling better yet? and, But you look so good. How do you explain that the pain is within, it’s part of you, redefining and reshaping all you think and do? Yet it’s invisible. It’s tethered itself to you and it plans to stay. describe our lives only too well. Furthermore, she compares pain to “a sour domestic partner,” intimate and ugly; a threatening, dirtying, distracting presence, yet one who refused to move out. Forceful analogies become vivid images to ponder. She compares chronic pain to a deer caught in a trap, the physiological terror and hormonal similarities; except only the human mind asks the all-important question,Why me? Functional and scientific explanations of pain pathways are given, yet are always interesting and basic, yet informative enough, for every level. Never is the reader left with a problem understanding or uninterested. Rather, one is creatively entertained and truly inspired. Throughout the book, we get a smattering of her own personal pain journey, and only hidden in the acknowledgements do we learn her beautiful and enduring destination. Beginning with an intermittent and lingering neck and shoulder swimming injury as a young woman, Melanie’s pain becomes angry and chronic. Numerous physicians can’t diagnose her injury and prescribe treatments that sometimes even cause her more pain. She lives with self-doubt and loathing, always questioning herself. While is great pain herself, she ultimately uses her skills as a writer to research pain and the various relief methods used throughout history. These include everything from spiritual, religious and cultural beliefs and customs, to incredible technological discoveries. From the beginnings of mankind, injuries and disease have prevailed. Despite great strides being made, medicine still can’t always fix it. Pain remains a mystery, a puzzle with seemingly never-ending pieces that must be located and formed into some shape to comprehend. Some fight and deny; others simply find ways to endure. The truly terrifying component is that the central nervous system rewrites itself over time, sometimes causing permanent pain messages to travel from the injury site. Cognition can be affected, as parts of the brain can be damaged. Even scarier is that immune function may be impaired. The same hormones that regulate the way the brain deals with pain can impair immunity. Cortisol increases, causing abdominal weight gain with all of its associated dangers. Additionally, pain can cause the brain to atrophy. As pain becomes more irreversible, it may also be less responsive to therapy. Luckily, the author notes, pain is now recognized as a disease itself, rather than just a symptom. This new pain perspective has opened up a whole new paradigm of thought and research. As a consequence, there is now tremendous hope for pain practitioners and pain sufferers alike. A version of this review originally appeared in the American Chronic Pain Association’s June newsletter, The Chronicle. I appreciate their sharing!